Up on my deck, next to the Bachelor Buttons newly destroyed by my maddening neighborhood squirrel, is this Lady's Mantle plant. The beautiful beaded arrangement of water droplets is pretty amazing, no? What at first looked random, with a closer look seems to be based on the ribs of the leaf, but how did there get to be so many different sizes? Why are the big drops out toward the edge? In another minute will they just start running down into the center of the leaf? Nope I've gone back up and looked several times in the past hour and they're still there in exactly the same positions. That makes me wonder, assuming they formed from the rain we had overnight, how the heck they have lasted through this boiling 90-degree day until now, mid-afternoon? 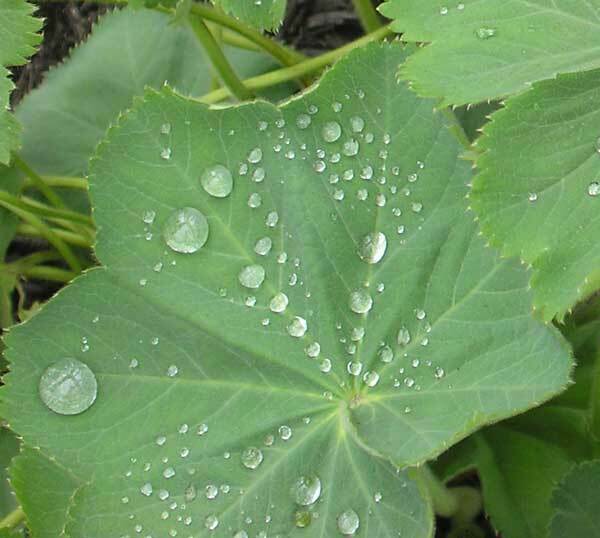 It turns out Lady's Mantle is particularly good at this droplet thing, which can potentially be explained by chemistry. Given my limited and hazy Chem 101 background however, I'm left to simply admire the beauty and respond to the wonder of nature, even up here on my little urban deck. This page contains a single entry from the blog posted on July 1, 2005 5:05 PM. The previous post in this blog was Everyone but Hilary. The next post in this blog is Unexpected 'Session'.